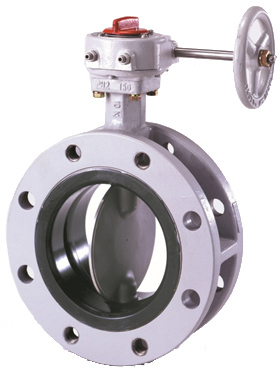 This valve can be safely installed at piping terminals and mounted directly on hulls. The retaining bushing and retaining plate used in the upper part of the valve stem keep the stem from coming out of the valve body, ensuring safe fluid control. A primary seal between the disc and the seat ring, and a secondary seal between the stem and the seat ring ensure a tight seal with no leaks. An O-ring provides a third seal between the stem and the bushing, and the bottom of the valve includes a gasket, ensuring every possible measure is taken to prevent external leakages. The valve’s smooth disc surface reduces fluid resistance and allowing for a compact, easily maintained structure. In addition, the upper and lower stem bearing bushings eliminate galling and burning by providing excellent resistance against wear and friction. Copyright (c) 2002 OKUMURA ENGINEERING Corporation All rights reserved.